A sticker on this new release from Nelson Freire quotes the words of a review that 'any new Freire recording is virtually self-recommending'. It's difficult to disagree and there's never any doubt in this Debussy recital that this is a master pianist at work, captured beautifully by Decca's engineers. It is another excellent addition to a catalogue that the Brazilian has been building up for the company over the past few years. The control Freire has over his instrument is astonishing and is particularly in evidence in the first book of Préludes, which opens the disc. Starting with 'Danseuses de delphes', his magisterial command is in full evidence, the voicing is subtly graded and the dynamics minutely differentiated (listen to the chords about two minutes in, for example). He brings an imperious sweep to 'Voiles' and an irresistible tenderness to a perfectly regulated performance of 'Des pas sur la neige'. In his hands, 'La Cathédrale engloutie' is a truly awe-inspiring edifice, built up musically with implacable solidity. Throughout the set, his ability to conjure up intoxicating sonorities and sounds of the most beguiling subtlety makes for some wonderful moments. However, there are times in the more sharp-edged or humorous pieces that one wonders whether he couldn't have varied the palette a little more; one could argue, for example, that he misses some of the capriciousness in 'Les collines d'Anacapri' and underplays some of the drama of 'Ce qu'a vu le vent d'Ouest', as a quick comparison with Krystian Zimerman's award-winning recording might suggest. His 'Fille aux cheveaux de lin' is a modest girl indeed and his 'Minstrels' are a touch straight-faced. These, though, are minor points that seem to melt into insignificance against the overall authority of his playing. Part of me wishes that he'd gone on, in the second half of the disc, to record the second book of the Préludes. Instead we have 'D'un cahier d'esquisses' and 'Clair de lune' – both exquisitely performed – positioned either side of Children's Corner. Freire approach strikes me as slightly less well suited to the less ambitious scale of Children's Corner than it does to the Préludes. As such, 'Doctor Gradus ad Parnassum' is impressive for its beautifully articulated passage work but sounds rather too careful. Similarly, Freire misses some of the lightness and humour of 'Serenade for the Doll' and his 'Gollywogg's Cake-Walk' is robust and rhythmically alert – with some delightful touches of rubato – but sounds heavy compared, for example, with Jean-Efflam Bavouzet on Chandos. 'The Little Shepherd', on the other hand, is another small miracle of sonority and voicing, while 'Jimbo's Lullaby' is beautifully expressive. 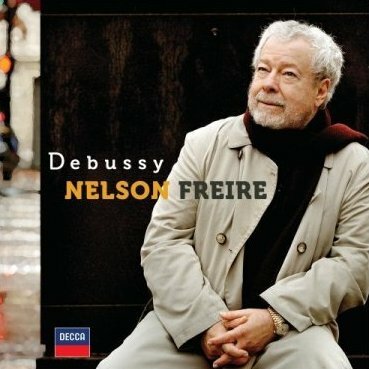 The CD's liner note give a personal account of Freire's relationship with Debussy, a life-long love that this recording has sought to express. 'No one could feel closer than does Nelson Freire to [Debussy's] sense of restraint and quiet sophistication', we are told, and this is a fair description of the Brazilian's approach. To listen to his playing on this disc it is difficult not to sense the enormous respect and love he has for the composer and the occasional lack of humour and impulsiveness seems to matter little given the sheer class of the pianism.